The Mendocino Complex Fire is still growing and has now destroyed a staggering 300,000 acres. Firefighters are growing weary and residents are too. Thousands remain evacuated, but as the fire moves into more remote terrain many are being allowed back home -- if they have homes to return to. Jodi Hernandez reports. Firefighters said for the first time Wednesday that they have made good progress battling the state's largest-ever wildfire but didn't expect to have it fully under control until September. 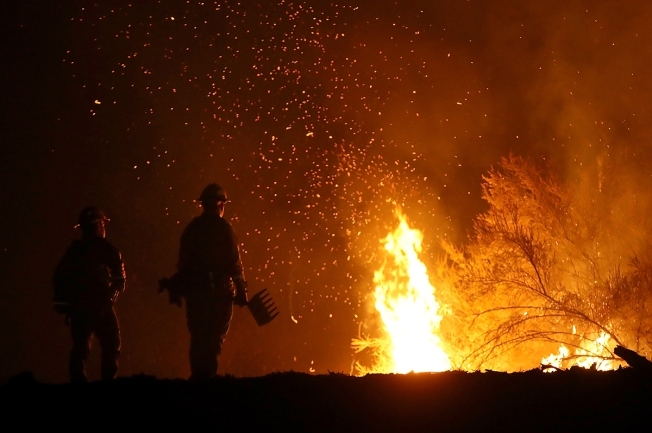 The blaze north of San Francisco has grown to the size of Los Angeles since it started two weeks ago, fueled by dry vegetation, high winds and rugged terrain that made it too dangerous for firefighters to directly attack the flames now spanning 470 square miles. Crews, including inmates and firefighters from overseas, have managed to cut lines around half the fire to contain the flames, the California Department of Forestry and Fire Protection said. The blaze about 100 miles north of San Francisco around the resort region of Clear Lake has destroyed 116 homes and injured two firefighters. Wildfires tearing through trees and brush, rampaging up hillsides and incinerating neighborhoods: The places and names change, but the devastation is showing signs of becoming the new normal in California. Jodi Hernandez reports. Cal Fire Battalion Chief Jonathan Cox said the area has few natural barriers to slow flames and terrain that firefighters can't get to. So firefighters fall back to the nearest road, ridge or river, where they bulldoze a wide line and wait for the flames to come to them. They are deployed statewide and led by Cal Fire. 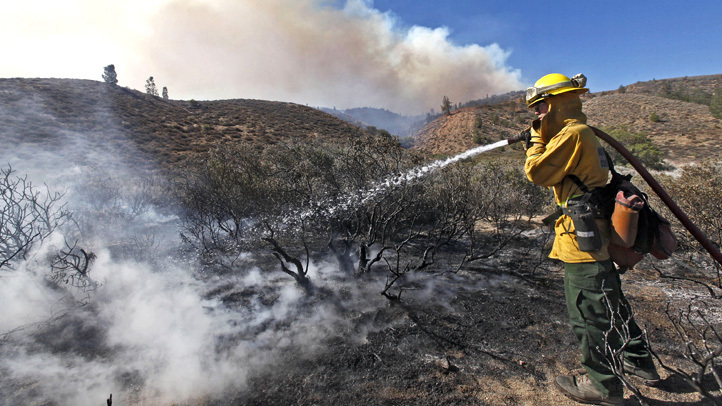 The state's firefighting agency employs 5,300 full-time firefighters and hires an additional 1,700 each fire season. Trained prisoners and firefighters from 17 states and around the world fill out the ranks. With more than 283,000 acres burned, the Mendocino Complex Fire in Northern California is now the biggest-ever in the state. But how big is it, in relation to places you recognize? Use the map below to explore the size of the fire on top of your city, state, or zip code. Firefighters under Cal Fire's command have helped Oregon authorities fight a fire near the California border and responded to a blaze that broke out this week in Orange County and burned a dozen cabins. The state's largest wildfire in history has drawn a contingent to battle what is actually two fires burning so closely together that they're being attacked as one. Though it's exploded in size, more firefighters are fighting a fire near Redding that has killed six people and destroyed more than 1,000 homes and businesses. 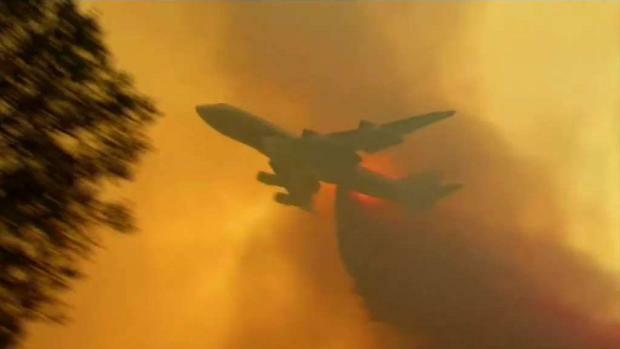 It threatens a much larger urban area, so Cal Fire has devoted more resources to it. 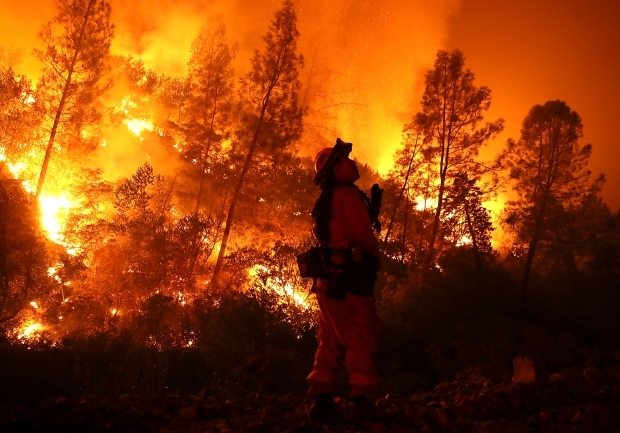 California prisoners also are fighting fires. Cal Fire trains minimum-security inmates and pays them $1 an hour in the field and $2 a day when they're not on duty. Inmate firefighters also typically have their sentences reduced for every day spent fighting fires. Craig Cottrill, chief of the Wellington Fire Department in New Zealand, said his country doesn't see fires nearly as big as California's. "Everything is on a 100 times scale," he said. "This thing's massive." "When those big events happen across the continents, we all pitch in," he said. The New Zealanders have been assigned as safety officers, line supervisors and heavy equipment "bosses" who direct bulldozer operators. They are undergoing four days of training to fight wildfires and are expected to be deployed to California next week, U.S. Army Col. Rob Manning said in a statement. Authorities haven't decided where to send the soldiers from the Tacoma, Washington-based 14th Brigade Engineer Battalion.